eforea spa at the Hilton San Diego Bayfront is an unexpected spa experience that offers a spiritual escape. Guests enjoy services that focus on balance and wellness, and embark on transformative journeys of the senses that help them emerge brighter. Enjoy local and results oriented skin and body therapies and well-appointed amenities including a nail salon, PreCor equipped health club, steam rooms and separate men and women’s relaxation areas. Located near the city’s downtown Gaslamp Quarter and the San Diego Convention Center, the Hilton hotel offers guests an effortlessly sophisticated mixture of vibrant elegance, inviting warmth and airy design over its 30 floors. eforea spa at Hilton San Diego Bayfront is a place like no other where you will reconnect with self and emerge brighter. eforea spa offers a relaxed and fresh motif in an intimate boutique-style setting. Our Essentials and Escape Journeys feature both results oriented and locally inspired therapies. Treatments include such classic staples as the Sea Stone massage and Custom Facial, as well as locally inspired unique treatments like our Honey & Milk Wrap and California Zen. Signature to eforea spa are the Journey Enhancements, powerful mini treatments that are added to your existing services or enjoyed by themselves. These treatments have been specially designed for eforea and introduce guests to special, commonly unexperienced techniques from the most fabled spa cultures around the world. Customized spa packages and group rates are available. To complement its spa menu, the Hilton San Diego Bayfront features educational seminars, yoga classes and meditation sessions designed to combat stress management, while weight-loss boot camp is available for guests that want to tone up. Fitness modalities include Vinyasa yoga, Pilates, Zumba and strength training, and personal trainers are happy to schedule a one-on-one exercise session. 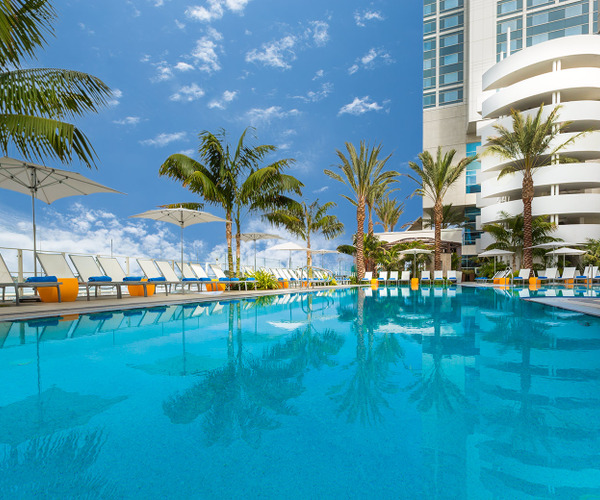 The hotel’s saltwater swimming pool, lined by white cabanas on a sweeping patio overlooking the bay, evokes a relaxed respite. An extensive collection of on-property venues for business meetings and social functions is offered as well. The hotel is within a 15-minute stroll of the city’s Gaslamp District, with its vibrant clubs, bars and restaurants. Other nearby attractions popular with visitors include the Seaport Village, Balboa Park and the San Diego Zoo. 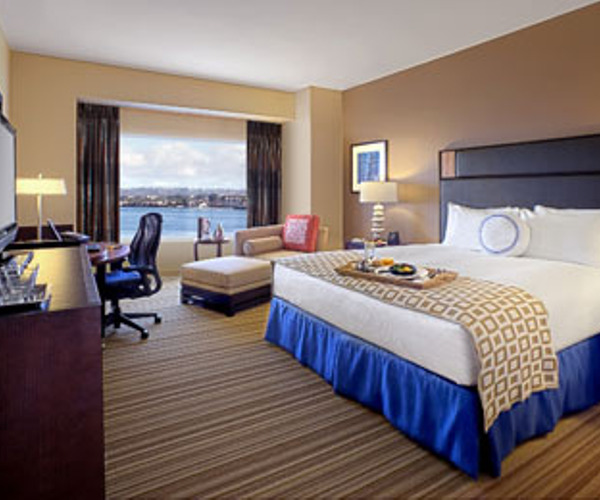 The Hilton San Diego Bayfront boasts more than 1,000 guest rooms and suites with gleaming Coronado Island, San Diego Bay and Pacific Ocean views. Rooms are accessorized with signature Hilton Serenity Collection® beds and linens, Peter Thomas Roth skin and hair products and high-speed Internet and flat-panel LCD HDTVs to provide a comfortable stay. Executive and signature suites also offer dedicated parlor areas and two-bay master bedrooms. The hotel has four restaurants to choose from, including the signature Vela, known for its bay views and vegan cuisine, and the Fox Sports Grill, where diners can enjoy their favorite sports game on one of 26 plasma-screen TVs while noshing on American fare prepared with fresh, local ingredients. Dessert or tasty snacks can be savored at Sweet Things Yogurt, while refreshing cocktails can be sipped at the poolside Bay Breeze or at the waterfront Odysea.